Medium Nut Wizard - Black Walnut Cracker for Serious Nut Crackers! nut picker, nut roller, gum ball picker, nut picker-upper, basket nut tool, nut grabber, yard roller, walnut roller, nut tool, walnut rake, nut collector, acron rake, sweet gum ball rake, and acron gatherer. The Nut Wizard is a great pecan and English Walnut picker-upper. This nut roller uses rows of metal wires to make up the basket. These thin metal wires spread open, easily picking up pecans and other nuts from the grass or ground, without losing what has already been collected. 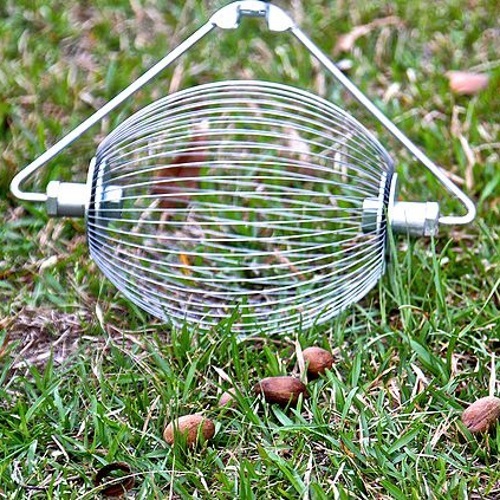 The Nut Wizard's basket turns over easily, unlike other nut picker-uppers we have tried. This easy spin motion ensures the nut roller can be pick up pecans with little back-tracking. The Nut Wizard also comes with a nut dumper. The nut dumper attaches to any 5 gallon bucket. Once the pecan roller is full simply push the basket on the dumper and it will spread the wire apart, releasing your bounty. My grandparents have three pecan trees in their front yard. We tried three different types of rollers before coming across the Nut Wizard. The other nut picker-uppers would not roll smoothly, meaning the metal wires would not spread to pick up the pecans. Finally my dad purchased a Nut Wizard for them for Christmas two years ago. Last year they picked up 300 lbs of Elliots with it. One of my Aunts saw how well it worked and she bought one and uses it to pick up Stewarts. After picking up our batch of pecans we sit down with our Kinetic Krackers and open them all up.